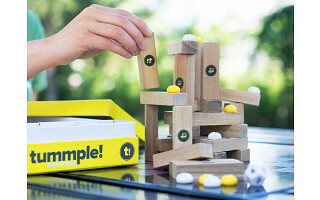 Next family game night, try something new with tummple!, a fast paced, highly unpredictable building game that consists of a combination of wooden bricks and plastic pebbles. The name tummple is a derivative of the Indonesian word tampuken, meaning “stack." The inspiration for the game came to creator Bruce Shadorf during a trip to Bali as he watched two local men stacking a pile of wood. Just as they placed the last log on the pile, the whole thing toppled over. But, with careful placement and strategy, their second attempt was a success. In the game of tummple!, plotting, planning and blocking are the key to winning. Small stones called “tumps” serve as obstacles adding an extra element of strategy to the game. Stack high. Build wide. Suspense grows along with the structure and tensions keep rising right up until the configuration crumbles. We’re not sure whether our testers had more fun stacking and blocking or watching tummple! teeter and eventually come tumbling down. One thing is certain—tummple! will keep kids and adults alike on the edge of their seats. It's a pleasure to be with all of you here at The Grommet, the first website on which tummple! is available. I can truthfully say that tummple! is my favorite game because you can never play the same way twice. It has taken years of development and improvements with a stand-up team to get here, and we hope you'll love tummple! as much as we do! 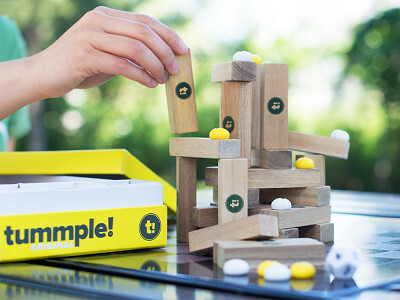 Next family game night, try something new with tummple!, a fast paced, highly unpredictable building game that consists of a combination of wooden bricks and plastic pebbles. The name tummple is a derivative of the Indonesian word tampuken, meaning “stack." The inspiration for the game came to creator Bruce Shadorf during a trip to Bali as he watched two local men stacking a pile of wood. Just as they placed the last log on the pile, the whole thing toppled over. But, with careful placement and strategy, their second attempt was a success. 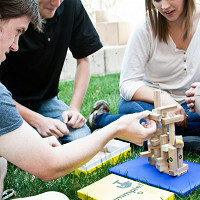 In the game of tummple!, plotting, planning and blocking are the key to winning. Small stones called “tumps” serve as obstacles adding an extra element of strategy to the game. Stack high. Build wide. Suspense grows along with the structure and tensions keep rising right up until the configuration crumbles.